Twitter users want spring to come early so they can wake up the Rosetta spacecraft lander Philae, which is currently “hibernating” on the comet Churyumov-Gerasimenko, as it rushes through space on its way towards the Sun. Although the Rosetta mission lander successfully reached comet 67P/Churyumov-Gerasimenko in November, communications were then lost as it fell into deep space hibernation to recharge its batteries with solar energy. Philae, which is some 500 million kilometers away from the Earth, is due to continue its exploration of the comet this March. Meanwhile my lander @Philae2014 is asleep on the surface of #67P. Maybe if we all shout #WakeUpPhilae this time…? However, Twitter users were so inspired with the Tuesday “wake” of the Rosetta spacecraft from its sleep mode that they have begun trying to wake the probe, Philae, with cheerful calls and “desperate” pleas. #WakeUpPhilae WAAAAAAAAAAAAAAAAAKE UP! If we all shout, @Philae2014 might wake up says @ESA_Rosetta!! The Rosetta mission is the first successful landing on a comet’s surface. It began its space voyage ten years ago, with three flybys of Earth and one of Mars. It has been orbiting the comet, which turned out to be smelly, since last September. @esa_rosetta@philae2014 When sunlight softly warms little Philae's face (and "wings" ☺️) we'll all call out #WakeUpPhilae ! Let us know! 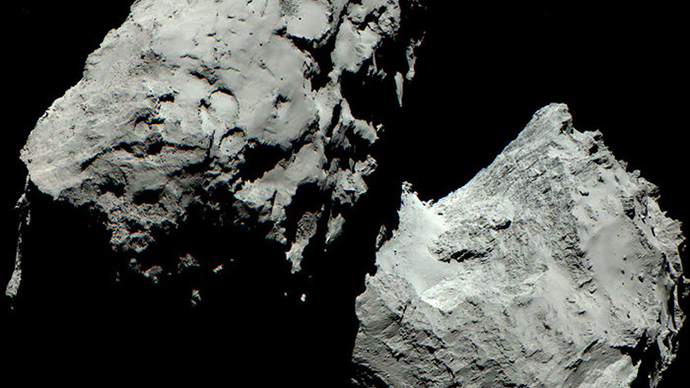 Comet 67P, looks a bit like a rubber duck, and belongs to the Jupiter family. It is a periodic comet with an orbit of 6.5 years, and it will approach the sun at its closest in August. Comet Churyumov-Gerasimenko was named after the Soviet scientists who discovered it in 1969. #WakeUpPhilae Like all kids you need to wake up and do your homework! Want to know what your new home is like, and importantly, how you are.